The sun is high and the weather is warm, so take your parties outside this summer. These fun themes can be carried outdoors for a great way to spend time with friends and enjoy the season. As a bonus, you don’t have to worry about cleaning your house before or after! This Hawaiian fest is all about bright flowers and fun outfits. Set the stage to transport your guests to the islands as soon as they walk in to your yard. Ask your guests to wear Hawaiian shirts or grass skirts, and you provide the leis. Play tropical music and serve exotic drinks with umbrellas. Use torches for light at night. Hang fish netting from railings, and set palm trees, either real or fake, throughout the area. For entertainment, play limbo and give hula-dancing lessons. 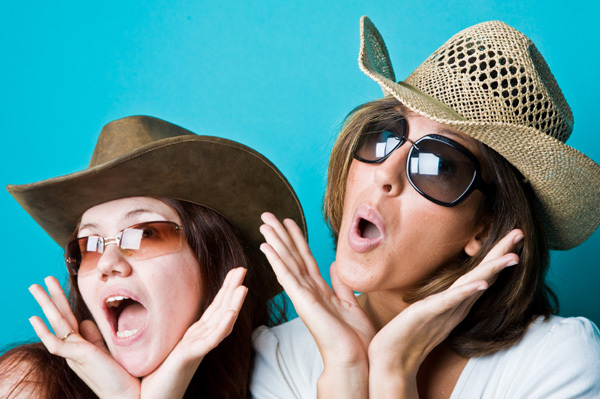 Ask your guests to dress the part in boots and cowboy hats. Use burlap for table covers and place flowers and candles in mason jars for centerpieces. Serve a full country meal, complete with shredded meat and sauces, macaroni and cheese, green beans and corn bread, followed by a variety of pies. Play country music and make sure there’s an open space for line dancing. If you’ve got access, offer tractor rides. Patriotic parties are a summer staple. Whether it’s for a national holiday or just to show your love for America, show your friends a good time with a USA-themed bash. Decorate using table covers, balloons, crepe paper and more in red, white and blue. Line your porch, patio or sidewalk with small flags, and when the sun goes down. offer guests a mini fireworks display if it’s allowed where you live. If not, play with sparklers instead. Take advantage of the warm weather and move your tea party from the dining room to the garden. Set up your table near lots of flowers, and add more with centerpieces and hanging baskets. Ask your guests to wear nice dresses, hats and gloves, and make sure to take photos. Serve small sandwiches, cookies and pastries, and use antique dishes and cups if you can find some. Serve a variety of teas, along with milk, cream, honey and sugar. If you’ve got a pool, you’ve got a party. Not much decorating needs to go into one of these functions. String up some lights to make the area feel more festive and to help your guests see at night. Serve light finger foods — no one likes to swim after a heavy meal. Have lots of towels at the ready, and keep some warm ones in the dryer for children. Think about the size of your pool before you make your guest list. Too many people in a pool can be dangerous. Host a backyard barbecue and ask all your guests to chip in. This takes a lot of the pressure off of you. You provide the meat, and everyone else brings a side dish or dessert. Decide if you’ll provide the drinks and place settings or if guests should bring their own, and then communicate this clearly. Make sure there’s plenty of seating for your guests both before and after the meal. Watch this video and learn how to hula dance.